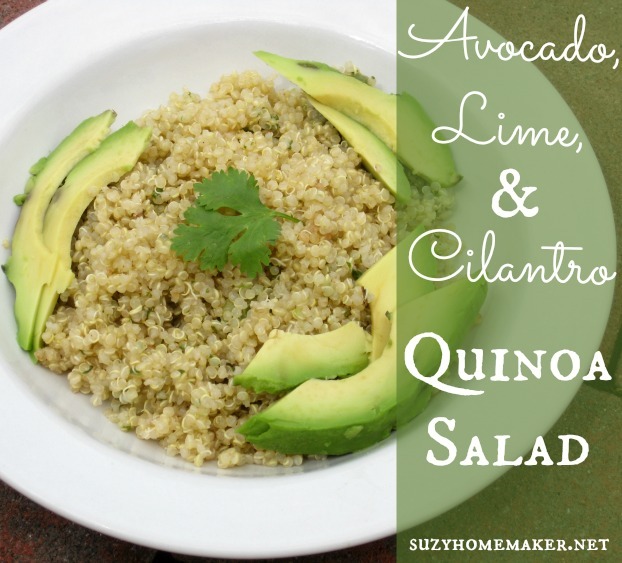 This avocado, cilantro, and lime quinoa salad is addicting. It has the perfect combination of flavors. I used to make it all the time years ago, and then hadn't for a while. My friend hunnerwoof reminded me of it in an email. The base is quinoa, a seed, and it is nice and filling. Plus you get nice yummy fats from the avocado, which also help to keep you fuller longer. I made a very basic vinaigrette for this, but my cilantro lime dressing or taco dressing would work well too. Be sure to rinse the quinoa well before cooking, otherwise it will taste bitter. I usually rinse mine in this about 5 times to make sure to get the saponins off. I let the quinoa cool and then mix all the ingredients together. I am not sure how long this will keep because it never lasts for more than a couple days in my house.